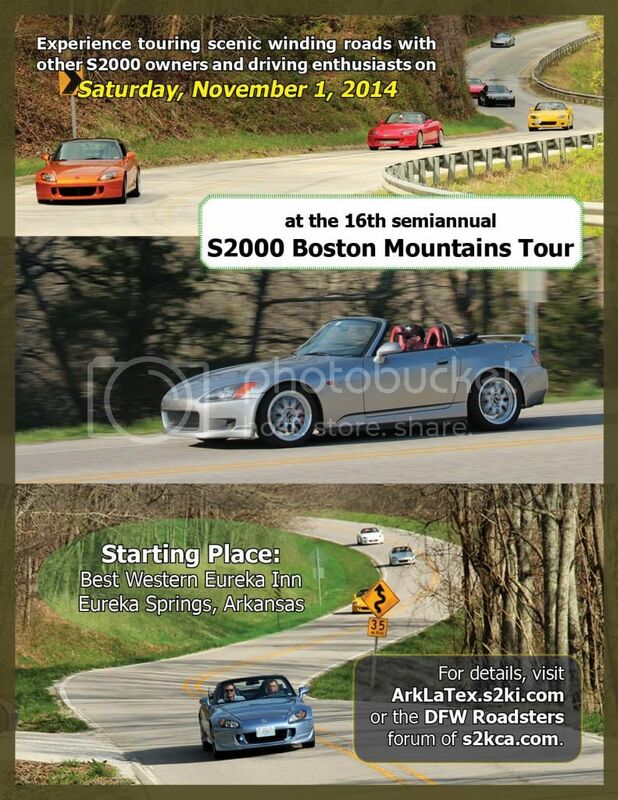 Dear Friends, You are invited to attend the 16th Semi-annual S2000 Arkansas Boston Mountains Fall Tour 2014. The Fall 2014 Tour will cover some of the best winding and scenic roads that the Arkansas Boston Mountains range have to offer. These roads can offer something challenging to even the most experienced drivers. Group Rate name:"S2000 Boston Mountains Tour"
We were able to get the same group rate as usual $89.95/Night for 2 queen bed room AND INCLUDES full breakfast buffet. Those from out of town, don't forget to make your reservations for 2 nights since we are ending the Tour in Eureka Springs. DragonDidg (Michael)Back from the Big Easy!! Bama Dave (David) going the distance !!! Count me in! Sign me up! Take my money!! Oh wait, this is free! Sweet! Put me down for 2 cars, my S2000 and register my friend Bob who drives a BMW E30 with LS1 swap. We were able to get the same group rate as usual $89.95/Night for 2 queen bed room AND INCLUDES full breakfast buffet.Those from out of town, don't forget to make your reservations for 2 nights since we are ending the Tour in Eureka Springs. riderguy57 +1 (Scott & Maureen)- Arkansas, will be attending again. Andy, please place us in the last group out, as my wife prefers that. Booking hotel room now! Looking forward to it! I'm going g to say I'm in, but put me as a maybe. If I get the motor swap done in time and clutch break in completed, I'll be there. Please add Mike Ruiz + 1 from OK. I'll sweep if still needed.